MD Anderson is one of only 40 comprehensive cancer centers designated by the National Cancer Institute. For seven of the past nine years, MD Anderson has ranked No. 1 in cancer care in "America's Best Hospitals" a survey published annually in U.S. News & World Report. Cancer Focus While the cancer center will provide care for all types of cancers, our primary focuses include: Breast cancer, Lung cancers, Gynecologic cancers, Gastrointestinal cancers, Prostate cancer, Skin cancers, Liquid tumors, such as lymphoma and leukemia. Special Features: Convenience, accessibility and healing are the cornerstones of the center. Its design merges the “high tech” world of medicine with the “high touch” needs of cancer patients to provide customized, holistic care. The center’s unique environment incorporates proven evidence-based design theories to enhance healing such as natural light, artwork, water features and views of nature. Patient and family amenities include: Expansive lobbies Outdoor balconies for infusion therapy Larger patient rooms and treatment areas Patient and family support Retail services. North Colorado Medical Center (NCMC) is a 398 bed regional tertiary medical center serving patients from a four-state region. Level II Trauma (ACS Trauma Verification); Level II Nursery. Full complement of sub-specialties, 24-hour ICU with EICU support, rapid response teams and FM residency program. 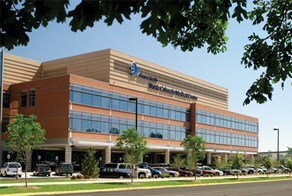 Recent expansion with focus on Cardiovascular and Surgical Services. NCMC provides the only burn center and air medical transport (North Colorado Med EVac) in northern Colorado. McKee Medical Center (MMC) is a 132-bed, acute-care hospital that has served the community for more than 30 years. McKee prides itself on providing excellent patient care and the latest in technological advances. Our hospital offers an array of inpatient and outpatient services including medical, obstetrical, pediatric, orthopedic, surgical, heart, cancer, and critical care. The McKee Cancer Center and McKee Breast Center are among Northern Colorado’s leading cancer diagnosis and treatment facilities. McKee is also a Level III trauma center. We are the only hospital in the Rocky Mountain region to be designated an Epicenter for robotic-assisted gynecological surgery by Intuitive Surgical, the manufacturer of the daVinci surgical robot. Our physicians, nurses and other health care professionals can train on state-of-the-art computerized patient simulation mannequins in our simulation center. McKee is accredited by The Joint Commission.